Within a couple of weeks of welcoming its first tenant, Middlesbrough’s vibrant new business community, Albert North, is celebrating once again after another business committed its future to the area. Keystage Recruitment, a leading supply teacher agency, has chosen Albert North as its new base. The company, which works across the Tees Valley and County Durham, had been based in Yarm but began looking for a more central location after recognising excellent transport links and accessible parking were important factors for clients. MD Julie Richardson said: “Before I set-up the business I worked for two different employers based on Albert Road and I’ve always considered it to be Middlesbrough’s commercial hub. “Whilst some of the properties have been empty for a while, I was excited to discover the plans to regenerate the area as it was the perfect location we were looking for. “I’m now back where I started my career all those years ago, I feel proud to be returning with my own business and I’m confident that this location will be great for us. 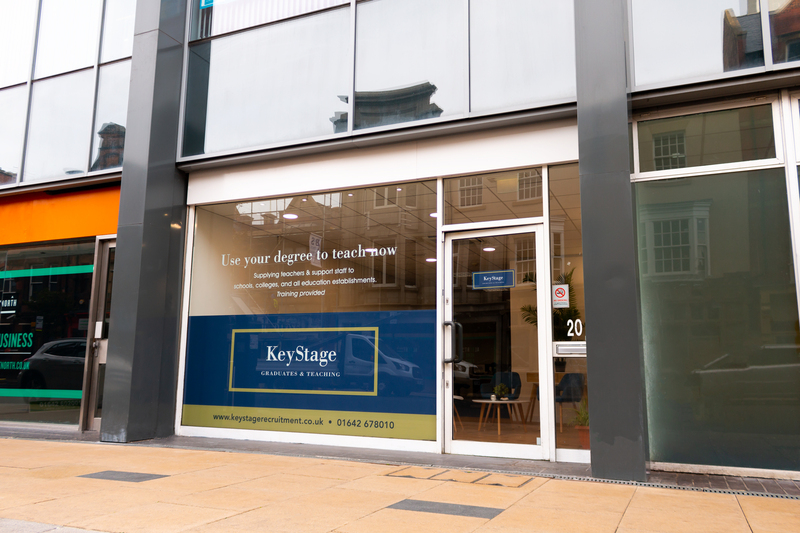 Keystage Recruitment has relocated to 20 Albert Road, occupying the ground floor of the newly refurbished space. Made up of a collection of eclectic buildings, Albert North will boast a number of modern studios and offices for small to large businesses, as well as food and drink outlets and city living apartments. The revitalisation of this prime city centre location, complement’s the area and is being welcomed by many businesses who are looking for modern, flexible office space to meet their growing needs. Earlier this month Albert North welcomed its first tenant Mabo Media, an award-winning PPC specialist. “We’re thrilled to welcome Keystage Recruitment to Albert North,” said Mark Hill, Commercial Property Director at Jomast. Our aim is to create one exciting business community so welcoming two new tenants to Albert North within the first month of its launch is testament to our vision for the area” added Mark. Julie said: “We’ve been in business for over 15 years, we’ve built a great reputation over that time, have recently rebranded, moved to a more central location and we’re busier than ever. “We also work closely with graduates offering them the opportunity to work as supply teachers in local secondary schools so the close proximity to Teesside University is an added bonus. The Albert North scheme includes a number of perks for businesses, including high-speed broadband, rent and rate incentives, free public health initiatives for all staff and a town centre loyalty card with exclusive discounts and incentives. The multi-million-pound regeneration project is being driven by local property developers Jomast in partnership with Middlesbrough Council. Jomast is one of the UK’s leading property development, investment and regeneration specialists with commercial and residential real estate assets in excess of £250 million.